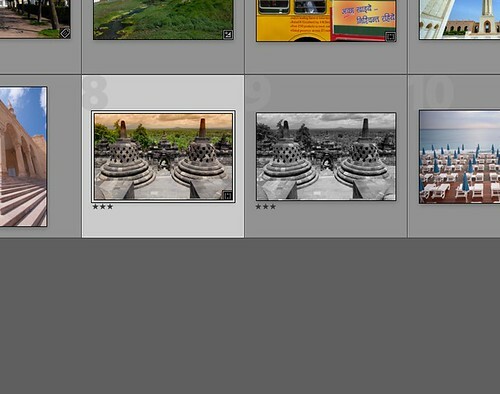 Adobe’s Lightroom is an incredibly powerful tool incorporating perhaps 80-90% of all the tools that we photographers generally need. There are however times, when we need to do some post production work in Photoshop, perhaps working in layers, maybe for the content aware move tool, whatever the reason, we need to be able to move cleanly from Lightroom to Photoshop and back, so called “round tripping.” With both products being Adobe and well integrated, this is fairly easy to do although it might not be obvious to everyone, how to do it. Today we are going to take a look at that procedure, allowing you to improve your Lightroom / Photoshop workflow. Setting Up: By default, when you install Lightroom, it should recognize a Photoshop installation and automatically connect with it. 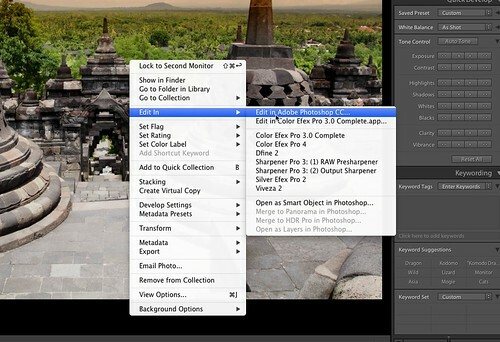 To check this and to make further preference changes, go to the Lightroom menu, and select Preferences. From the tabbed window that opens, you should see that the third tab is External Editing. Clicking on this should, in the upper section, show that Lightroom has recognized your Photoshop version. The other options can be changed to suit, although Adobe recommend that you keep the color space as ProPhoto RGB. You can change the file format between TIFF and PSD, the bit depth, keep it at 16 Bit for ultimate color quality, the resolution which is a default of 240, you may wish to increase this to 300 if you are outputting larger images to print and the compression. Selecting no compression will give you the very best quality but also very large files. You will also see a duplicate of the upper section below, allowing you to add other third party external editors such as Gimp, or, for example stand alone HDR software. Once you are happy with your set up, close the preferences dialogue. You can now make any adjustment to your required image in Lightroom’s Develop module before we send it off to Photoshop. Once happy, in either the Library or Develop modules, right click on the image and select the Edit in Photoshop option. Depending on the original file type (generally non RAW files) dialogue will open asking if you wish to either edit a copy with the Lightroom adjustments added, edit a copy, this will send only a copy of the original with no adjustments or edit original. Bear in mind that unlike Lightroom, Photoshop uses destructive editing so any adjustments made to an original will be permanent. 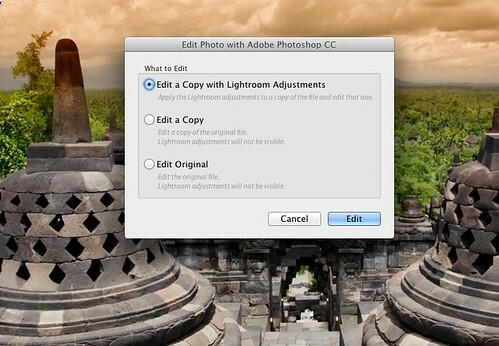 If you have already made some Lightroom adjustments, then the first option is the best. If you are editing a RAW file, the image will open directly in Adobe RAW, however if the RAW file is not compatible with your version you may be requested to upgrade. If Photoshop is not open, it will automatically open when you send the image. The Return Journey: Once your image is opened in Photoshop, you can use all of that program's powerful features to manipulate your image. Once happy the return trip is very easy. 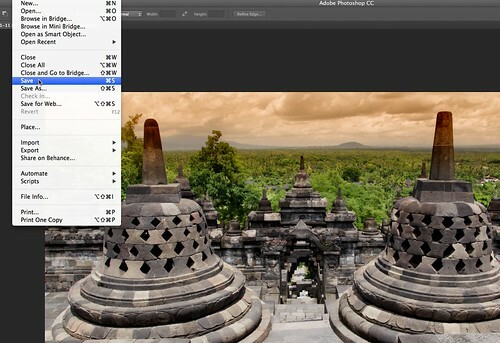 Simply select File Save from the Photoshop menu. 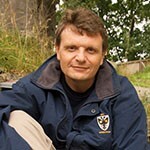 You will see that the file name of the image will automatically change to include a -edit suffix. It is important that you do not change the file name yourself in Photoshop as this will break any links back to Lightroom and require that you re-import the image manually. You do not need to close the image in Photoshop but in Lightroom you will see that a new version of the original image has appeared in the Lightroom catalogue with the file type you selected in your initial preferences, either TIFF or PSD. If you leave the file open in Photoshop and carry out any further work, every time you save the image, the adjustments will be updated in the Lightroom catalogue. It’s a simple as that. Round tripping between Lightroom and Photoshop opens up the doors to the full range of Photoshop’s powerful editing features, allowing the photographer to seamlessly work between his Lightroom catalogue and Photoshop itself. One small caveat that is worth remembering is that because the returned files are PSD or TIFF, if you work on a large number of images, you may find your hard drive space being eaten by the extra size of these files, but this is a relatively minor price to pay for the great flexibility round tripping offers.